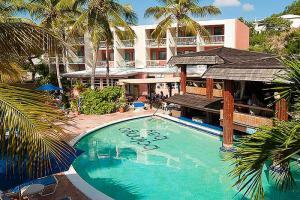 Located on 1000-foot golden sand beach, the Bolongo Bay Beach Resort offers an abundance of activities and exceptional amenities. Explore the complimentary and unlimited use of non-motorized water sports, fresh water pool and swim-up bar. Enjoy the free Wi-Fi throughout the property as well as in the guest rooms. Relax and unwind in the spacious and comfortable guest rooms, many of which are beachfront and ocean views.